Use this link to sign up for Draftboard and get a RotoGrinders Exclusive offer: Deposit $20 and get a $20 matching bonus! Let’s dive right into our Draftboard review. 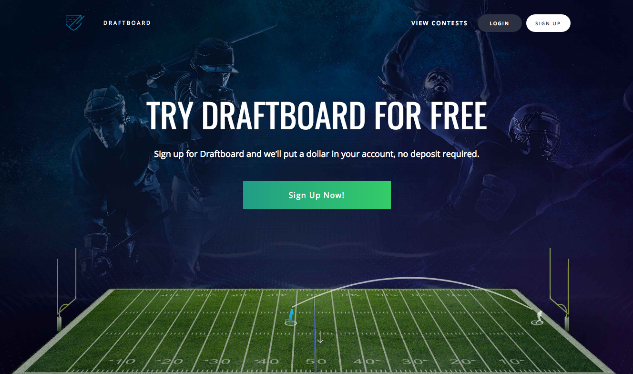 It’s no surprise Draftboard is taking a purposeful and unique approach to DFS given it was founded by professional poker player Phil Galfond. Most often recognized by his Full Tilt Poker nickname, “OMGClayAiken”, Galfond is a highly successful online poker player known for his innovative and unpredictable style of play. Draftboard hopes to achieve a more level playing field for users through its Fair Match™ contest entry system, and more enjoyable experience via its visually impressive Live sweating dashboard. Currently, Draftboard is a web-only platform, but the user experience is extremely simple, smooth and intuitive. You won’t struggle to find what you’re looking for, create a team or enter a contest on Draftboard. Creating an account is as simple as entering an email address and a screen name, after which you’ll be immediately credited with a free dollar. Get your RotoGrinders Exclusive Draftboard bonus offer: Deposit $20 and get a $20 match! In order to play on Draftboard, you’ll have to turn on your browser’s location services. If you’re unsure how to turn on location services, Draftboard has a handy guide available right on the site. Once you’re logged in, you can jump into a contest by selecting a sport and a skill level. Draftboard offers contests for NFL, NBA, NHL and MLB. Games are all salary-cap based, and range from head-to-head (H2H) matches, 50/50s and Tourneys (GPPs). For all sports, lineups consist of eight players and a $50,000 salary cap. One of the main ways Draftboard differentiates its DFS offering is through the Fair Match™ system, which automatically manages the way lineups are entered into contests. 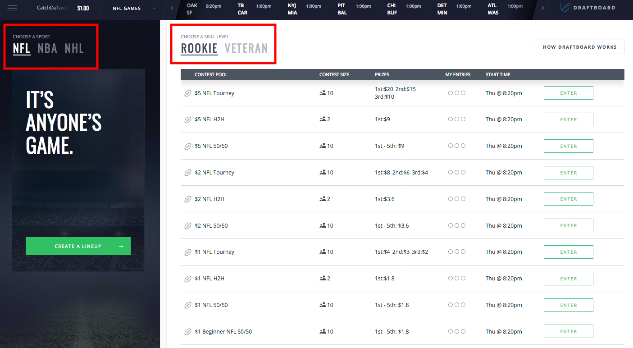 The first level of the Fair Match™ system categorizes users as Rookies or Veterans. Rookies enter a lobby with buy-ins ranging from $1-$5, while veterans can select from contests $10 and above. Players can only enter contests from one of these lobbies per day, not both, so lower stakes casual players can avoid playing against high stakes regulars. Whereas the Fair Match™ system attempts to innovative contest entry and fairness in the name of game sustainability, Draftboard Live’s goal is much simpler: to get players to sweat their contests right on the Draftboard platform. The level of detail is incredible, and the function is as good, if not better, than some of the league-owned gamecast areas. Over the course of the relatively short history of DFS sites not named DraftKings or FanDuel, there haven’t been many true innovations. Draftboard has taken a step toward changing that narrative, and it may be the reason it eventually finds a footing alongside the two titans of the industry. The Draftboard support team is easily reachable and responsive via email: support@draftboard.com. Before a deposit can be made, Draftboard needs to verify the identity of its users, which is done quickly and easily through the site’s verification process, or by contacting support. Once you’re verified, deposits can be made by PayPal or credit card (both processed through PayPal). All Draftboard withdrawals are sent via PayPal. Can I play on Draftboard? We give Draftboard our full recommendation. At less than a year old, the player pools leave a lot to be desired. But the amount of players on the platform is growing, and with exceptionally innovative features like the Fair Match™ and Draftboard Live, we could see these guys becoming a real player in the DFS industry. Draftboard just needs more people to try its game. And once they do, word is going to quickly spread about how great it is to have a level playing field and the ability to sweat gamecast-style right from your DFS platform. Draftboard offers a truly unique DFS experience, and is worth checking out.